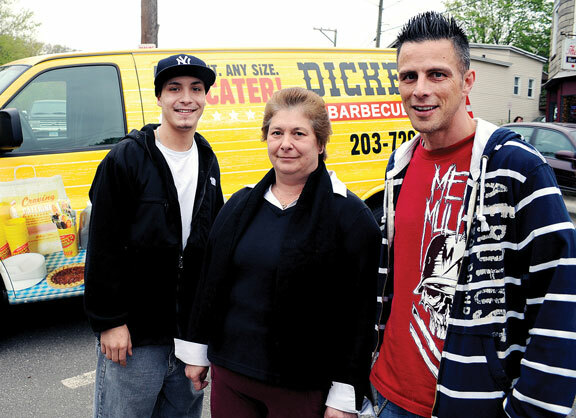 Donna Ferrari knows Naugatuck residents have plenty of options when they get hungry for pizza or burgers. But what do they do when they want barbecue? 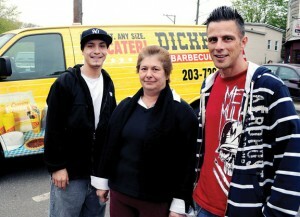 Ferrari and her husband, Mark, who recently sold Ferrari’s Appliance on 160 Rubber Ave. to their niece, Stacy Ferrari, are getting ready to open the second Dickey’s Barbecue Pit in Connecticut in a 12,000-square-foot portion of the same building that houses the appliance store. Though they sold the appliance store, Mark and Donna, who live in Middlebury, still own the building. The new restaurant is scheduled to open in about two weeks, she said. The space in which the restaurant will be located was last occupied by a hair salon, she said. Dickey’s Barbecue Restaurants is the nation’s largest chain of fast-food barbecue restaurants. Since selling its first franchise in 1994, the chain has expanded to the point where there are now 220 Dickey’s restaurants in 40 states. The first Dickey’s in Connecticut opened its doors on Main Street in Bridgeport last December. Naugatuck Mayor Robert Mezzo agreed that the new restaurant will be bringing something different to the borough. Though she anticipates the majority of the business to be of the take-out variety and is hoping to establish a brisk catering business, Ferrari said the new restaurant will feature five or six tables and a large counter for customers who would prefer to dine in. She said she expects to hire between eight and 10 employees, not including herself, her husband and their two managers, William Herens, a nephew, and Ryan Ferrari, their son. Ferrari said she and her husband are planning to open at least three Dickey’s restaurants over the next year or two, with the second most likely being launched within the next six months. She said the locations of the second and third restaurants have yet to be determined and will depend on where the couple can find and secure appropriate sites. Their preference, she said, would be to locate all three restaurants in greater Waterbury. The first Dickey’s Barbecue Pit was opened in 1941 in Dallas by an entrepreneur named Travis Dickey. Travis’ sons, Roland and Travis Jr., took over the business in 1967, turning the single location into a chain of restaurants throughout the Dallas-Fort Worth area. Today, even though the company’s extensive roster of franchisees has given the chain a national footprint, certain things are still done in the traditional manner established by Travis Dickey back in the ’40s, according to the company’s website. Every location still slow smokes all of its own meats — the same way Dickey did in 1941. The company assures a certain amount of organizational continuity simply by requiring each new franchisee to take an intensive three-week training course in Dallas before they can open the doors of their restaurant. In the Ferrari’s case, Donna and the restaurant’s two managers each completed their three-week training course last month, while Mark completed his session last week. Mezzo, who said he can’t wait to sit down at the restaurant and enjoy some barbecue, said he believes the economic tide is starting to turn in the borough after several difficult years during which the community lost a number of businesses in both the retail and food service sectors. He said he is beginning to see “signs of improvement” in the local business community.